One of the most iconic jet fighters in the second half of the 21st Century is the vertical and short take off landing AV-8B Harrier II. The signature capability of the Harrier, none found on other jets in its time, proved to be extremely advantageous in the Falkland War. You can read more on the Harrier’s history and development, particularly in American hands here. This is my third model completed in 2013. 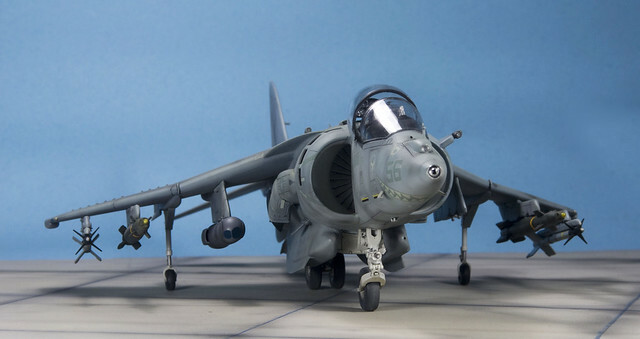 It is Hasegawa’s AV-8B Harrier II in 1/48 scale. I actually started this kit in the later half of 2012 but since I had to finish off other projects, I placed this kit on my back burner for a while. This Harrier is my third AV-8B – all from the same manufacturer. A couple of years ago, I worked on an advance version, the AV-8B ‘Plus’ Harrier II which has a radar in the same scale. 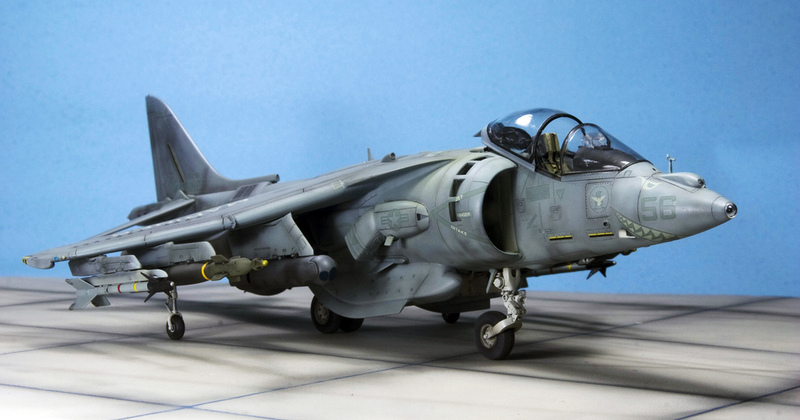 The next Harrier II project was identically the same aircraft as this one but in the smaller 1/72 scale. The decals were almost perfect. As I found there were some silvering in the process, I used my Revell Decal Softener which proved to be invaluable. 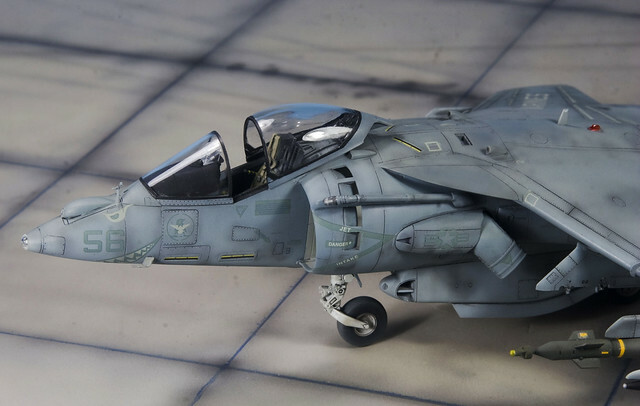 This kit is by far one of the best commercially available scale model of the AV-8B Harrier II in 48th scale. In appearance, this Hasegawa kit comes in a pretty small box. But you will be absolutely surprised on how much plastic they were able to pack inside! As with Hasegawa’s 1/48 scale aircraft series, the level of detail, as anyone can expected, is just superb. The options are equally beneficial. You get to arm your Harrier with either gun pods or just the lateral streaks. 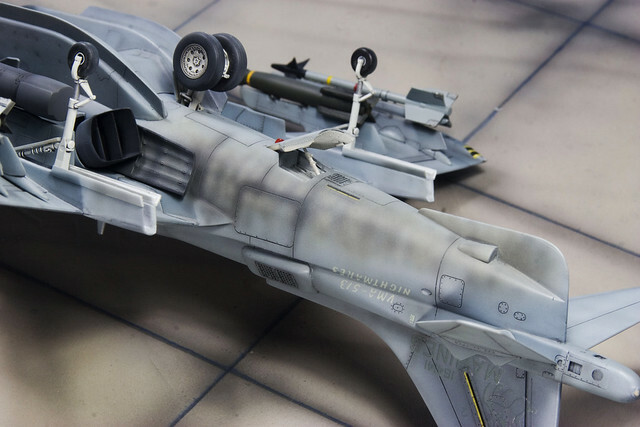 Hasegawa gives you decals for the dashboard and side panels. But they also have nice raised surfaces – something that you can easily dry-brush to bring out the details. 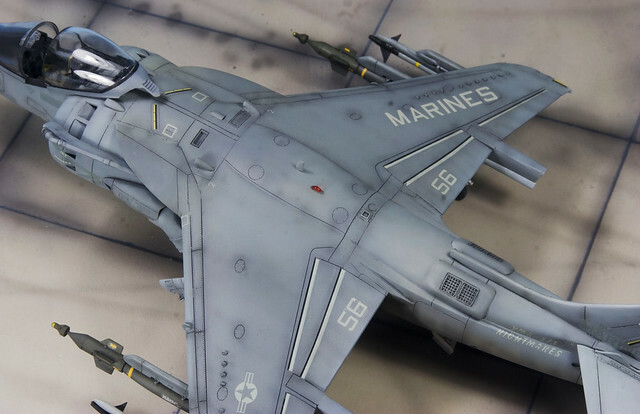 You also get a large sheet of decals which let you make two complete US marine aircraft in either VMA-513 “Nightmares” or VMA-311 “Tomcats.” Here is an excellent website that gives an all-around review of this kit. With all the good stuff in the box, it doesn’t mean that this kit is perfect and flawless. The construction, on the other hand, is a long and twisted tale… Throughout the construction process, you will be faced with consistently annoying fitting issues. They can be as difficult as the LERX fitting which requires extensive putty, or as mild as the uneven seam lines that run through the fuselage halves. Many of the parts that need gluing have imperfect seams which require additional putty – all of which contribute to the slow progress of the construction process. The fitting quality of the kit’s parts which contribute to the slow process of puttying and sanding is perhaps the Achilles heel of this kit. As with all Hasegawa modern jet kits, it is no secret that the manufacturer hardly provides sufficient weaponry. Generally, one would go and fetch a Hasegawa weapons set from the store. And that is exactly what I did. I bought Weapon Set-D (X48-8) which has all the smart weapon goodies. The choices were overwhelming but I had to make the cut. JDAMs and GBU-12 Paveway IIs were some of my choices. But eventually it all came to the later one. The Paveways were painted with Tamiya XF-62 Olive Drab and sprayed highlights with Model Master’s Faded Olive Drab. Smart bombs from Hasegawa Weapon Sets are a worthy asset. I painted the whole model using Gunze’s Mr. Color range of lacquer paints. Since I ran out of my stock of Model Master FS paints a couple of years ago, I switched supplies to Gunze’s simply because the paints are easily more accessible (and affordable) from this part of the world where I live. I painted the typical three-tone tactical camouflage of the “jump jet” using Gunze 337 (FS35237), Gunze 307 (FS36320), and Gunze 308 (FS36375) respectively. Honestly, I felt my new Gunze paints did a much better job in coverage, smoothness, and opacity. Even when I had to spray tight and uneven surfaces, I did not get any “orange peel” effect that I usually encounter working with Model Master enamels . They only drawback of this lacquer paint is its terrible (and intoxicating) fumes which I resent so much! Never open a bottle of Gunze lacquer without proper spray mask in a well ventilated room. 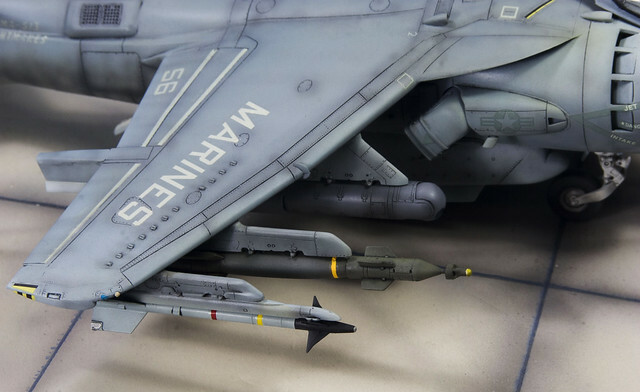 One of the unique weathering signatures of the Marine’s Harrier IIs are these exhaust streaks. These streaks, which have a rich mixture of brown to black shades, extend all the way to the tail’s lateral fin. Hasegawa has provide you with markings for two complete aircraft. One is a lively and colorful AV-8B from U.S. Marine attack squadron VMA-311 “Tomcats”; the other one is a muted colored bird from VMA-513 “Nightmares”. Both claimed to be the markings when the aircraft was operational in 1998. I decide that for this project, I will go for the latter one in the hope to turn viewers attentions toward its weathered and beaten-up paint job, rather than its colorful squadron markings. The decals are registered and very nicely printed. The decal sheet also includes markings for the two AIM-9L Sidewinders that came with the kit. 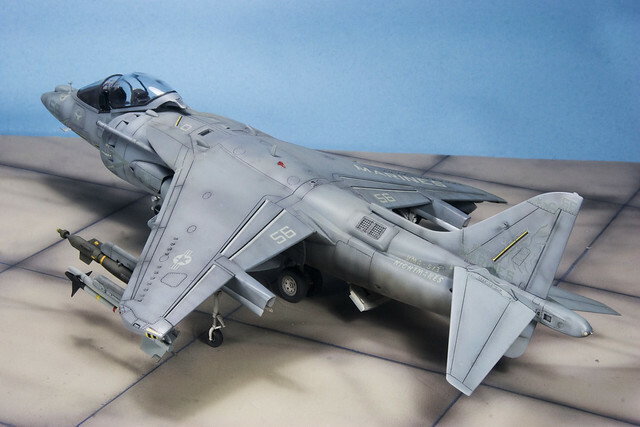 The decal solution that I used for this project is Revell’s Decal Soft. This is something out of the ordinary as I usually rely on my Microset Micro Sol to help me soften my decals. But I’ve always wanted to try something new. So, I decided early in the project that this will be the test bed for Revell’s product and see how it fared. As it turned out, The Revell decal softener is a pretty STRONG solution. My hasegawa decals reacted very well with the solvent – some times “too well”. I had to work relatively quicker as it “melts” the decals faster than using Micro Sol/Set. Be aware that Decal Soft creates a cloudy white residue around the decal you placed. But you should not be alarmed as this is nothing permanent. A spray of Future Floor Polish over the dried decals will help remove the residue. This is by far one of my best build so far. A very enjoyable project indeed despite the sluggish start. I think there were some die-hard challenges, but overall the model came out really well. The result is just superb and is what I have expected from such a kit of this scale and quality. The end note to this all is that I felt very proud to have given this kit the the opportunity to represent a well-worn US Marine Corps light attack aircraft. panas yang teroksidasi di logam. Hi Yatnika… thanks. Saya baru aktif lagi isi Blog ini.